We were at the William Sonoma store a couple days ago and they just received the limited edition Gingerbread Man cake pan. 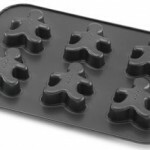 It is a nonstick baking pan that transforms Gingerbread Men from the traditional flat cookies to delicious little cakes. Pan bakes six individual Gingerbread Men shaped cakes with their familiar outline and three-dimensional detail so you can catch them right out of the oven and add currants for eyes and cherries for buttons. I plan to whip up a batch of these tasty cakes this coming weekend. 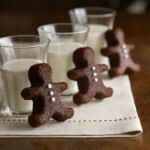 Posted in Edibles, Gingerbread Men | Tags: Gingerbread, Gingerbread cake, Gingerbread Man, Gingerbread Men cake.Gingerbread Men, William Sonoma, William Sonoma Gingerbread. Great idea for a cake pan! It does look like it would be so easy to make little individual gingerbread men. I wonder if there is a recipie included?